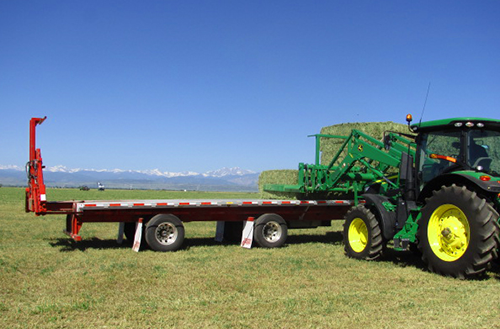 The Stinger ALSS has front and rear bulkheads, clamping the load of the bales which are stacked perpendicular to the trailer, while most loads of bales are hauled and have been tested with the bales loaded parallel to the trailer. 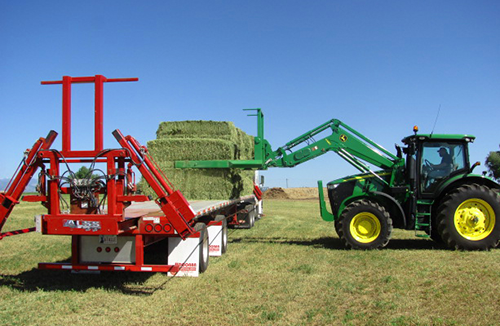 These two features do not allow the bales to split and even on the least secured bale, requires a force 4 x the bale weight to make it start to come off the trailer. 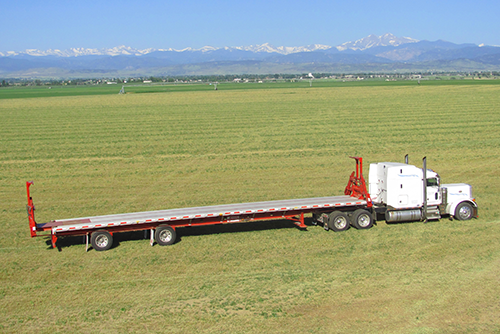 Performance in roll-over and acceleration testing, exceeded the specifications set by innovative vehicle testing in preperation for the FMCSA's technical review of industry cargo securement practices, for baled hay and straw, dated July 7 2008.
the system is fully automated, and controlled, from the safety of the cab of the truck. No operator is ever in the dangerous loading zone, throwing straps.